Most controls in WPF inherit a series of mouse input events from the UIElement class. This includes the PreviewMouseMove (tunneling) and MouseMove (bubbling) events. 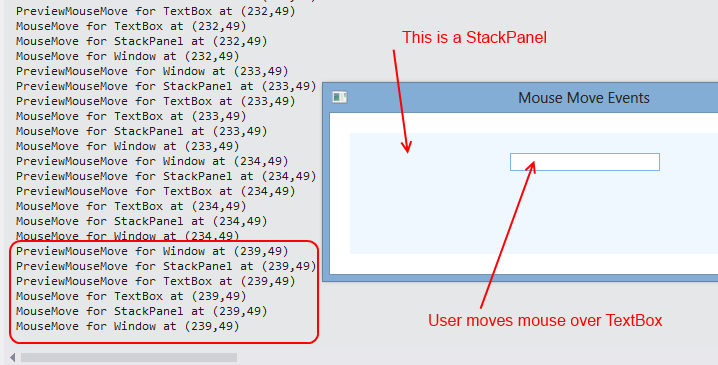 The MouseMove events indicate that the user is moving the mouse across the element in question. As the user moves the mouse, the event fires for the control that the mouse is over. Because these events propagate, however, the events will also tunnel down to the control that the mouse is over and then bubble back up the logical tree. Thank you for this! Very very needed for my project. My project and I thank you for this. Perfect explanation of tunneling vs. bubbling.